Joan Naviyuk Kane is the author of Milk Black Carbon, The Straits, The Cormorant Hunter’s Wife and Hyperboreal. She has received a Whiting Writer’s Award, the Donald Hall Prize in Poetry, the USA Projects Creative Vision Award, and an American Book Award. 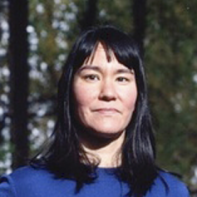 Inupiaq with family from King Island and Mary’s Igloo, she raises her children in Anchorage, Alaska, and is a faculty mentor with the low-residency MFA program at the Institute of American Indian Arts in Santa Fe, New Mexico. This interview was conducted via e-mail by Interview Editor Nicholas Femiano. Of the process he said, “Conducting this interview was a delight. The first time I read Joan Kane’s poetry collection, Milk Black Carbon, I was so taken by its vivid imagery and creative use of language, it became apparent to me that I needed to talk to her.” In this interview Joan Kane talks about motherhood, language, and the synesthesia of Keats. Superstition Review: I noted in my reading that change and movement are both common themes in this collection. Could you talk a little about these themes? How has your own life changed since you first started publishing, and how has that influenced your writing? Joan Kane: It’s always seems like more fun to hear what themes come through a collection for a reader (if a poet is lucky enough to have a reader) than it does to make the poems in the first place. I suppose there’s plenty of change and movement in MILK BLACK CARBON because when I was writing this book, I was preoccupied with organizing an expedition across the Bering Sea to my mother’s childhood home Ugiuvak, on King Island. The Bureau of Indian Affairs shut down the school on King Island in 1959. Most King Islanders were relocated to Nome or Anchorage then. My grandparents and younger uncles left King Island after 1965. My mother hasn’t been back since 1974. I’d never been until 2014, and found myself suddenly in the thick, anew, of so many of the dynamics that have dominated life for Inuit for millennia: change and movement. Both have been accelerated through non-Inuit culture: contemporary dominant culture, climate catastrophe, and continuing colonialism. I published my first book when I had long since given up on a literary career. Actually, I gave up on a literary career in 2001 during the first semester of my MFA at Columbia University. When I was done in NYC, I’d moved back to Alaska, had my first child, worked extensively in public policy, was an executive appointee in the second Bush’s second administration. I was pregnant with my second child and chose a publisher for my first book that would allow me to vanish into the kind of obscurity I wanted: motherhood. I’m a mother. I’m a wife. I started publishing decades ago when I was a single woman in my 20s in NYC with so few responsibilities. Now, I think it’s fair to say that I am the sum of my responsibilities. Responsibilities to my family, but also to other writers, Native and non-Native both. I think that influences my writing in ways that I’m figuring out as a I write: how are we all connected? How can literature change to realize more of the cognitions and presence of non-dominant culture? Am I still allowed any obscurity, and if so, how can I protect it? SR: I love that you included a few Iñupiaq poems in this collection. In an interview with Pasatiempo, you talk about how you consulted your mother and other tribal elders to help you find the right words. The way you introduce a communal hand to the written word is rather beautiful and poetic. What do you think is the importance of community in the shaping of the written and spoken word? JK: Our language is alive. We’re creating new songs and inscribing ourselves into them. Inuit ice and land are still here, and therefore, so is the language. It's not lost. We’re not lost. Every King Island descendant that hears and uses our language reminds me that we don’t have a bunch of assimilated-beyond-recognition English-only-speakers: there are hundreds of potential speakers of the King Island dialect in my immediate community. I’m not involved in language Jesus work. I can’t play into some narrative of loss and salvation. I cannot burden my work as an artist, as a human being, as one framed by crisis. SR: In this interview, you also talk about placing the English and Native poems beside one another in order “to examine the gravity of difference, to look at the privilege involved in knowing a word’s meaning.” Can you expand a little more on the idea that meaning is a privilege? JK: Meaning depends on context, right? Well, I bring the context of my privilege of having heard the Inupiaq language spoken between fully bilingual speakers. I bring the privilege of having been able to spend luxurious amounts of time interrogating via the OED every English word I choose to write. I have the privilege of approaching people within my community and asking, what does this word mean to you? What do you remember of this word? How do you think the word will change as our language changes? I bring my context as an Inupiaq woman born and raised with my relatives, my family, my community. That’s meaning. That’s privilege. SR: I noticed this book utilizes a lot of synesthesia. A passage from the poem, “Exhibits from the Dark Museum,” exemplifies this: “Your voice,/a sforzando of light as it strikes the rock-/ridge hung above the dwellings.” I can simultaneously see, hear, and feel the “voice” in this passage. Why is synesthesia a prominent technique in this collection? How does that relate to your own life experiences? JK: I blame Keats. Ah. Let’s just say, I remember (synesethetically of course) hitting puberty and obsessing over the work of Keats entire during the summer of 1989. I think, too, I reread Nabokov entire when I was writing this book, if not this poem in particular. I’m a miserable metaphor and simile-maker. I ‘m almost uninterested in these gestures, I’m so bad at them. But synesthesia is as close as I’m ever going to get at moving images from my mind/body onto the page. I think it also might have to do, content-wise, in this poem, with the notion that what is collected in museums is only the physical component of an object. I may only get to touch my grandfather’s drum (housed at the Anchorage Museum) in the company of a curator, with latex gloves on my hands, but his song resides with my children, his grandsons. Wherever they go. SR: Your poem titled “Headline News” consists entirely of found headlines from the oldest newspaper in Alaska. The result is a narrative of public perception on Alaskan Natives. How did you come up with the idea for this poem? Could you describe the process of compiling these headlines? JK: I meant the poem to be a public interrogation of the visible white supremacy of Nome, of Anchorage, of the United States. My relative Kiminaq (born and raised in Nome) was watching my boys when I went to the Anchorage Library one morning, and I found a little tome in the stacks that listed every headline the Nome Nugget (still published weekly with headlines like “Musk Oxen Kill Three Sled Dogs Last Week” and a section that lists every racially-motivated arrest of Native people) from the paper’s founding until 1976. I think I just transcribed the ones that struck me as ironic, unbelievable. As “fake news.” The ones that dwell, like me, in contradiction. SR: You received your BA at Harvard, your MFA at Columbia, and you are now a faculty mentor at the Institute of American Indian Arts in Santa Fe. You’ve been immersed in a variety of literary communities. What has been your experience going from student, to master, to mentor in these various literary climates? JK: My maternal grandfather spoke no English, yet supported a family of more than ten children in the cash economies of Nome and Anchorage. This kind of experience is not the exception at IAIA, it’s the norm. I don’t know how I could stomach teaching in another environment, one that foregrounds white privilege. Harvard and Columbia were not easy. IAIA is not easy, but the difficulties there are productive ones. Not the types of difficulties that make it nearly impossible not to become a dropout. My parents worked hard to raise me with my culture and language and with access to everything I wanted to learn. I’m still learning. I have never learned so much as I learn teaching at IAIA. I don’t take IAIA for granted. If I can help Native writers make their manuscripts, I’m fortunate. JK: At this moment I’m sitting in a room overlooking one of the last untouched parcels of the boreal forest in Anchorage. There’s a music stand, three bookshelves, a beanbag, and a storied white chair that once seemed to belong in the Alaska State Governor’s Office. There’s a snowglobe on a drafting table next to a pad full of drawings from my younger son. It’s snowing outside. It’s also like that Morrissey song “Girl Least Likely To” up in here: “recycled papers / paving the ground / she lives for the written word / and people come second or possibly, third.” I sometimes write in my actual office at home, which is lined with two thousand books. I sometimes write in my dining room, which is very rarely used for dining. When I started responding to these questions, I think I was on an airplane flying to Juneau, Alaska. Yesterday I was writing with my laptop out in the driver’s seat of my car in the parking lot of my son’s school (it was 11 degrees with wind from the east at 15mph). I don’t idle my car. It got cold and my battery died quick. My most favorite writing space might be in row 4 of any Alaska Airlines non-combi plane, though.